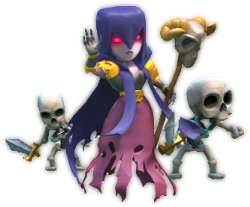 The witch is the final troop unlocked in the dark barracks, it is a powerful troop because she deploys skeletons on the battlefield. The witch doesn’t have much health, it is almost the same as the wizard. Be sure to assist her with a few Giants or other high hit point troops to distract the defenses. The witch deploys skeletons, these also attack the enemy base. The witch will deploy new skeletons when they die. This way you can clear some bases with ease when strategically deployed. The witch has low hit points, so is recommended to support her with a few strong troops to distract the defenses. Like Giants. Place her at the back of a base behind walls where an splash damage defense can’t hit her. The skeletons will continue to deploy and attack the defenses. If you have a strong lighting spell it is recommended to take out some splash damage defenses first. When a witch is attacking you from a clan castle use your lighting spell to destroy it. Otherwise the waves of skeletons will keep attacking you. When you use the witch in your clan castle, place it behind walls. That way she can keep spawning skeletons without getting attacked. The skeletons attack at almost the same strength as the level 6 archer. There can only be a maximum of skeletons on the battlefield per witch. (6 total for level 1 and 8 total for level 2). Rage spell don’t work on the skeletons. A video with witch attacks and a strategy guide how to use the witch the best.